First of all, if you’re not following this series, you should be. Seriously, you need to read this! 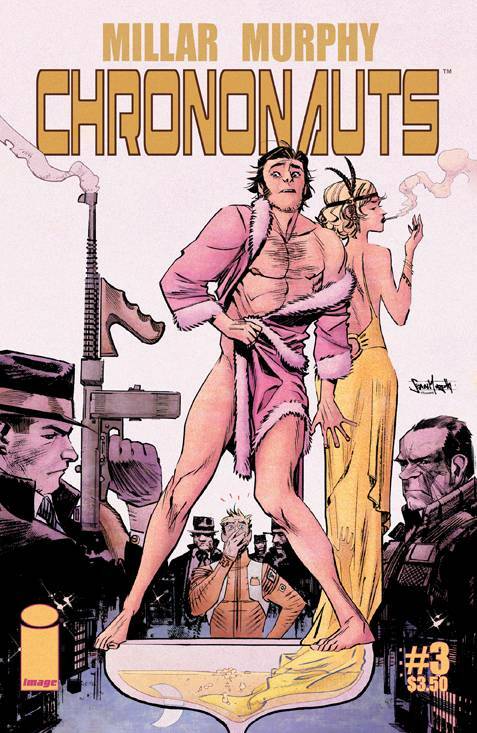 Chrononauts #3 is another action-packed issue by Mark Millar and Sean Gordon Murphy. 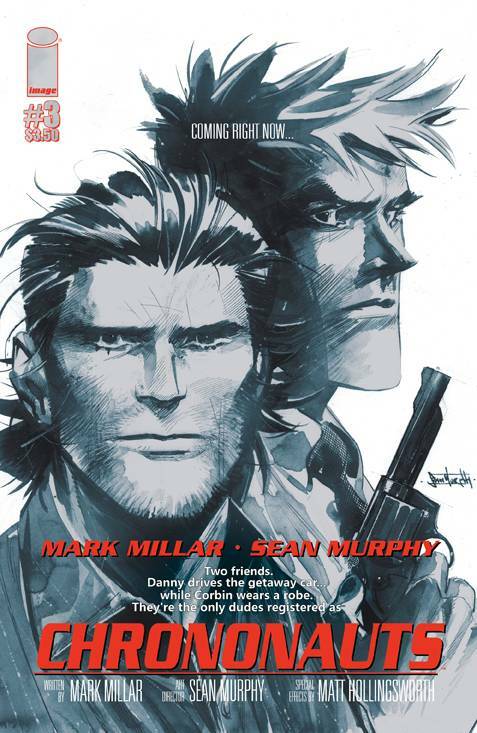 It is still early days for this book but Millar has made sure the momentum of the first two issues hasn’t subsided. The issue opens with Danny Reilly clearly exploiting the time stream for his own personal gain. It is 1986 and Danny is the main lyricist for the rock band The Smiths while he also finds himself at odds with Morrissey. Not only has he ripped off all of Morrissey’s would be lyrics, he has also written Harry Potter and Breaking Bad years before they J.K. Rowling and Vince Gilligan have even played with the ideas. Jump back to 1929 and Dr. Corbin Quinn has found himself at the mercy of a vicious gangster who has destroyed Quinn’s time suit. Just before Quinn meets his end, an elite team of time travelling soldiers, known as Alpha Team, intervenes and completely wipes out the squad of gangsters. They announce they are there to apprehend Quinn and Reilly for wreaking havoc with the time stream. Quinn swiftly dives out a window and onto a car Danny Reilly is driving. What ensues is nearly a full issue of a time travelling car chase that looks like something straight out of a motion picture! Millar and Murphy did not hold back in this issue! The chase spans numerous time periods from 65 million years BC to what would have been the assassination of John F. Kennedy in Dallas, 1963, had Reilly and Quinn not intervened in their car chase. What I loved about this issue is that Millar let the art do the talking. Millar brilliantly wrote a high-speed chase that felt like it belonged on the silver screen but wisely chose not to fill those pages with an abundance of unnecessary dialogue. This allows Murphy’s art to tell the story and flow beautifully from page to page. The reader’s eyes can drift from panel to panel without being bogged down in dialogue, which only helps build the momentum of the chase. Murphy’s art is undoubtedly the star of this issue. Not only does it tell the story beautifully but it is clear Murphy did his homework before drawing each time period. The detail he included in each era really makes them come to life. The panels concerning the construction of the Great Wall of China are beautifully detailed with workers using tools and shows off the technology used during its construction. The panels concerning JFK in Dallas look like the exact scene where JFK was assassinated and Murphy even managed to include the Hertz/Chevrolets billboard on top of the building behind JFK’s entourage. The panel of Kursk, 1943 looks like an actual battle scene and a mere three pages later the reader is staring at a ferocious T-Rex from 65 million years ago. All these panels and time periods flow beautifully together and really make this issue look like a non-stop action blockbuster! Even with the bare minimum of dialogue, Millar has crafted an issue that really highlights the concerns of time travel (if it was possible, of course.) The car chase alone has caused some serious alterations in the time stream – JFK escapes assassination, the Roman’s witnessed an army jeep shooting up a chariot in the middle of Circus Maximus and the 1969 Super Bowl turned into a bloodbath. All of these forces the reader to think of the consequences of these actions but only time will tell. 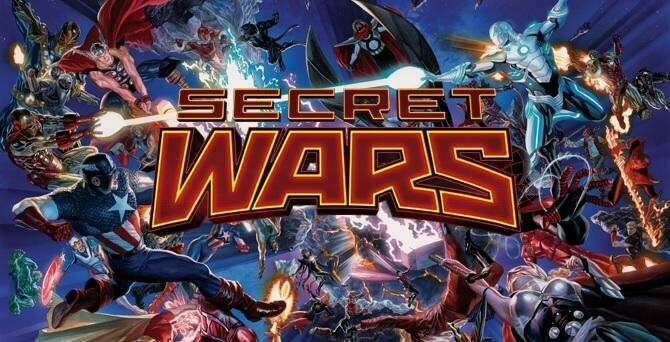 I’m excited to see how these have changed the future in coming issues, that is of course if Reilly and Quinn ever actually return to find out! Chrononauts looks like it’s shaping up to be one of my favourite books I’m currently reading. The simple reason why I love this series so far is because it’s FUN, simple as that. Millar has crafted a fun story that delivers on action, contains interesting characters, and the premise is fascinating! Not to mention, Murphy’s art is an absolute joy to look at with the turn of every page. The movie variants by Murphy are reason enough to pick up this comic!